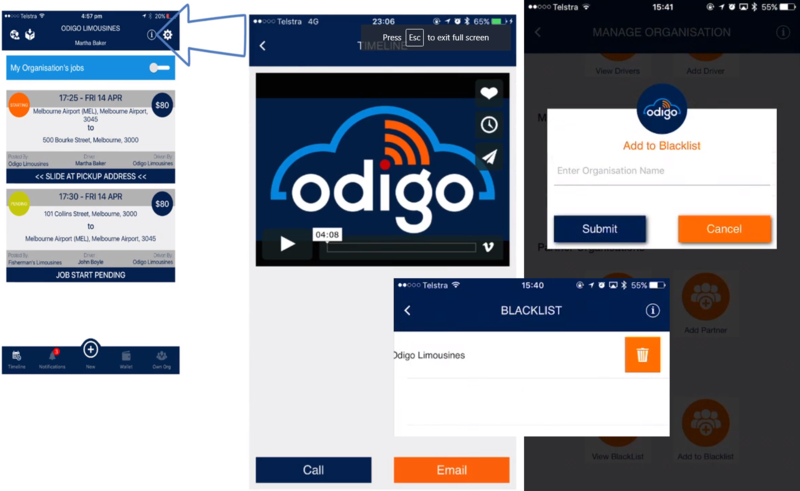 Odigo is one of the most challenging Mobile App projects we have undertaken and delivered successfully. Odigo is an on-demand application for Cab booking with a very different work model unlike its major competitors like Uber and other trending chauffeur service provider apps. The major difference being it's a SaaS model app for chauffeur company owners and inspite of using services from Odigo, Owners are directly in contact of their customers and receive their bookings. Now let's see what the app offers. Android App, iOS App, SaaS Model, White Label, Payment API, Wallet system, Live Tracking, Notifications, GPS and Maps, REST API. 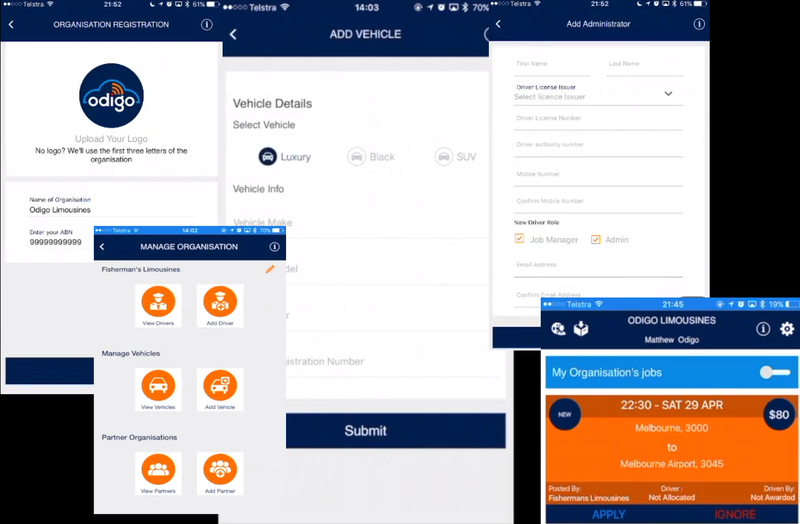 SaaS Model - This app allows different chauffeur businesses to register on the app and supports 3 different types of users Business Owner, Job Managers and Drivers. Having no subscription costs to use the services of the applications, businesses pay only a minor service fee for each booking they make. The app allows businesses with single or multiple users to get registered on the app. 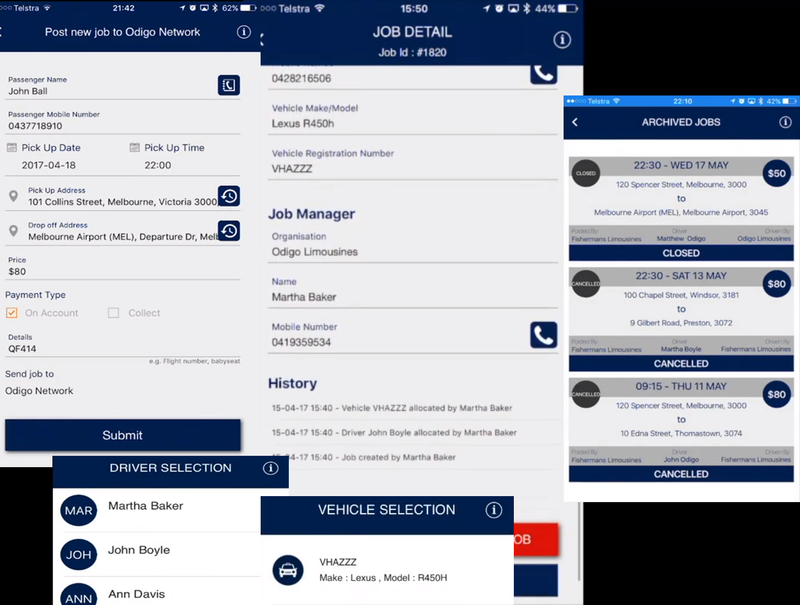 Businesses can add their branding, drivers, vehicles and managers to the app. Each user has Role Based Access on the app. Managing Jobs - Unlike other apps, this app has a different model and allows only Business Owners and Job Managers to post the jobs on the app. Jobs are assigned to own Drivers or other Chauffeur businesses registered on the app. 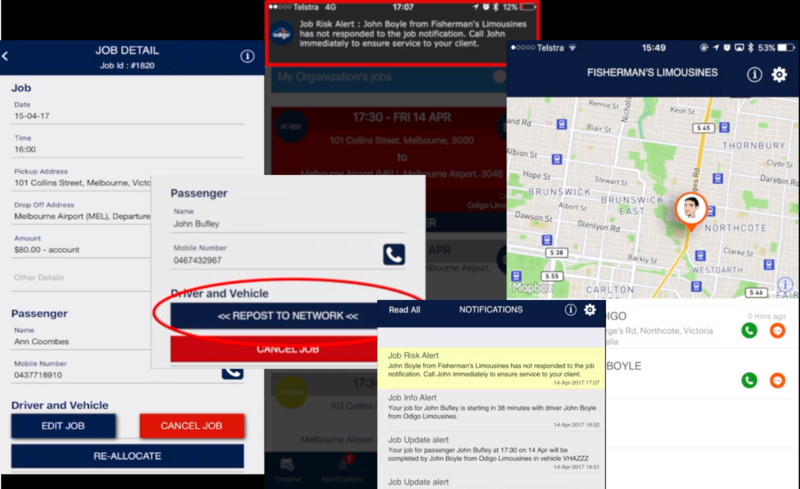 Jobs can also be transferred to other networks from own network if the Driver rejects the job or fails to accept in due time. Another interesting feature for Managing the Jobs is Job History which stores every activity and notification from the very second the job is posted to its completion. The completed and cancelled jobs are transferred to Archive. Real Time Tracking and Notifications - Odigo allows very efficient real time tracking of the drivers on job allowing business owners and job managers to review the route being followed and current location of the driver. Apart from this, there are different Notifications triggered at different stages of the job. Posting a new job, pending to be accepted by Driver, No Response, etc. are different stages which have different Notifications and accordingly different Functional buttons intelligently placed to help the Job Managers and Business Owners act according to the status of the job. 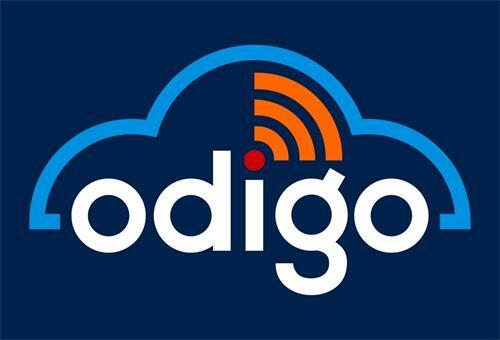 Payment and Wallet system - Odigo allows very easy payment collection method for its users. Customers can pay for the service via Cash or directly to the account of Business Owner on the app. 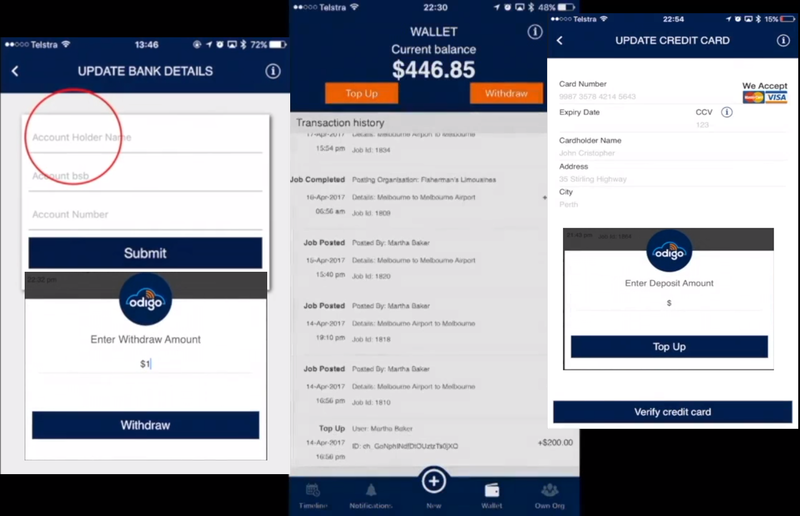 Business Owners can add money to their App wallet using their CC and a service fee of posting a job is deducted from the wallet directly. Wallet is also used to pay for Jobs being completed by other businesses. Others - There are many other features that complete the app and are very useful for the users such as Help screens and videos, SMS and Email notifications, Ability to blacklist other networks, Monthly Payment reports, etc. Odigo was the second project we have completed with Dikonia. We involved the Dikonia team right from the beginning and were helped through the uncertainty, with strong commitment and dedication demonstrated from all the team members. 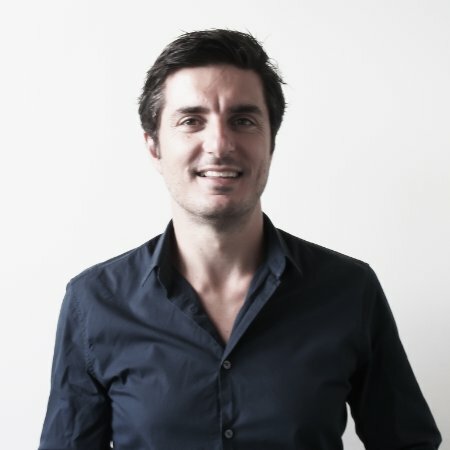 Odigo integrates together many complex technologies to automate as much of the chauffeur business for operators and the team members showed their high quality skills through this project. Many thanks to Chhavi, Sajal and the rest of the team that contributed to our project!